The biggest news is that this will allow T-Mobile the spectrum it needs to rollout a competitive LTE network. In fact, T-Mo's CEO John Legere hopes to some day be able to "taunt" competitors over their LTE coverage. From a company that already boasts it has the "nation's largest 4G network" based on its HSPA+ coverage alone, it's a predictable yet very bold claim. Of course, it's reasonable to be skeptical that MetroPCS is going to suddenly make the new network a Verizon killer. Of course, questions arise on just how the two carriers' technology will be integrated. MetroPCS does have some form of LTE (even if speeds are much lower than competitors'), but the main network is CDMA, while T-Mobile uses GSM-based service. Despite this, Legere insists that "This is not a replay of a debacle that people have seen in the past...We will not smash together two networks with differing technologies." Comforting words, but we'll have to see how it plays out. Perhaps the new company will simply commandeer the old spectrum, however with plans to shutter the MetroPCS network by the end of 2015, that doesn't leave long to get existing customers on to new hardware. Assuming the deal goes through in the middle of 2013, there will only be about two and a half years before the old CDMA network has to shut down entirely. Sure, that's longer than the length of most contracts, but MetroPCS isn't known for having customers that upgrade to the latest and greatest with much gusto. We can probably expect to see some aggressive handset deals that not-so-subtly nudge subscribers over to GSM-based phones sooner rather than later. Still, the company has a long way to go before it can "win," as Legere touts. T-Mobile is quick to point out that the new company will be a top-tier leader in no-contract plans. Currently, both carriers are known for offering post-paid service that is competitive with the larger carriers, however in terms of actual customers, separately they have lagged behind. 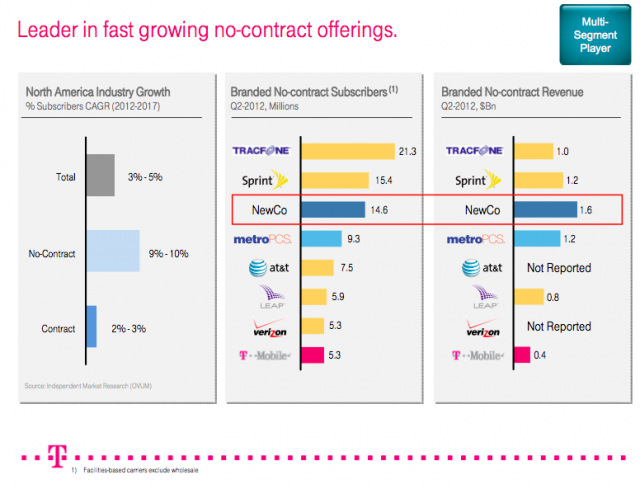 By their own estimates, the merger should give the new T-Mo the third-largest contract-free subscriber base at 14.6 million (behind Sprint and TracFone), yet the (potentially) highest revenue for those subscribers. This is all well and good, but keep in mind that post-paid plans are a minority of customers. While Legere may be excited, it's still yet to be seen just how much benefit this will be to customers. The deal will actually be conducted via a reverse merger, which means that MetroPCS will technically be acquiring T-Mobile and assuming the latter's name. The advantage is that the new carrier will have publicly traded stock. Deutsche Telekom will still hold a 74% stake in the company, leaving MetroPCS with 26% (as well as a payment of $1.5 billion in cash). This may be a good move as it will allow for new investors, but it could also cynically be perceived as a way for Deutsche Telekom to give itself an escape route. Since the AT&T acquisition fell through, the European company has been eager to unload T-Mobile USA. Under the new model, Deutsche could sell off stock in the new carrier slowly, or remove itself entirely if it so chose. As of now, there's little to do but wait. In the meantime, what do you think? Are the MetroPCS owners among you happy or angry that you'll soon be under big Magenta's rule? T-Mobile customers, are you excited about the prospect of a shiny new LTE network?